Improve your drum tracks with 100% live and authentic blues drum loops compatible with all major DAWs. With over 1000 drum loops and fills for blues, blues-rock, and country music songwriting styles, Drum Werks III will take your songs to the next level. Nearly 700 MB of acoustic blues drum loops for blues and bluesy-rock songwriting, this is as realistic and authentic as you can get for loop-based songwriting. The drums sit perfectly in the mix and will inspire anyone writing guitar-laden blues and roots music, be it acoustic or electric. This collection focuses exclusively on 12/8 feels. Whether you had a “Blueberry Hill” vibe in mind or wanted a “Blues Power” Albert King groove, Drum Werks III will serve up the pure swing and smack of authentic live blues drumming. Stop fooling yourself that MIDI will give you the feel you need. Your blues drum tracks deserve nothing less than pure, live, 100% acoustic real drums. Over 1000 loops organized by tempo, style, and loop type make finding the right loop a breeze. Many longer loops are also included on the disc (entire verses, choruses and breakdown sections) to give an even more authentic bluesy feel to your drum tracks. Covering a wide range of tempos and enough 12/8 grooves to jam for days, Drum Werks III is all you need to compose new blues and bluesy-rock tracks. A warm mix of earthy drum sounds as well as fat grooves makes this the sample library to create the true blues groove pocket your tracks deserve. This is how you bring the Blues Power! Versatile Grooves and Sounds: Drum Werks III offers a versatile songwriting tool for anyone looking for a natural acoustic sound with natural resonance and room ambience and a host of great “in the pocket” grooves. Tired of the excessive compression and reverb you find on other loop CDs? Drum Werks III delivers the sounds and grooves the way songwriters need and want it. Cohesive Groove Sets and Sounds: All loops and samples are taken from the SAME recording session so they are sonically-matched. All the grooves, groove variations, fills, and one shots WILL mix with anything else on the disc. 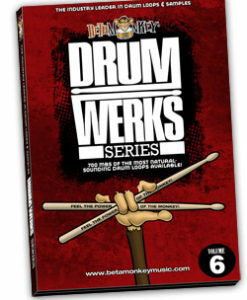 Drum Werks III was recorded on a DW Maple recording kit in one New York City studio. This gives the user unlimited “mix and match” capabilities. Cohesive Drum Sounds: Drum and Cymbal Samples: We took the kit used in the recording sessions and included multi-velocity samples of the drums and cymbals recorded for the Drum Werks III recording session. 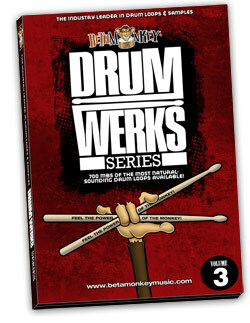 Use the Drum Werks III sample kit to build grooves from scratch or use them to augment any of the 1000+ loops. This disc gives you true flexibility. 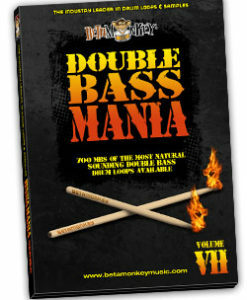 1040 (697 MB) original, license-free 16/44 drum loops and samples. Available as 16-bit ACIDized WAV, APPLE LOOPS (AIFF), and REX2 loops. ALL available ACIDized WAV, APPLE, and REX2 formats included in download and physical DVD purchases. I don’t often write emails back about a product especially if it is good, just my nature I guess. But I just had to say WOW on the quality of your work. I am heavy into cover tunes and play parties and Saturday night local gigs (50 to 70 capacity max) and the response I have had with these loops is really inspiring. People are so used to a real live band and then I come in there and it is just me and with an occasional extra guitar player. I actually lay down the bass tracks and play to that. EQ is very important, I found that out kind of the hard way. Anyway I am rambling here but the point is Your stuff is the big winner. Thank you again for the fast courteous service. Professional thru and thru. Keep up the great work and DON’T change a thing! Just wrote a new song using Drumwerks III. Thanks again for the awesome drum sounds. I finally settled in using your loops from Drum Werks VI, and gotta say I’m very happy with your product. Having purchased Drum Werks III, VI and Natural Grooves, I got enough pro session work to keep me occupied for months (or more! ), FOR $50.00! Thanks for being apparently the only guy out there putting loops together for more than the techno-remix crowd.